Fall is here! Well, actually, we're in the THICK of it now. Never have I been so excited for fall! Seriously. I used to be a summer goddess; sunshine and heat all the time was my mantra (odd for a Canadian, I know). To state the obvious: as we get older our tastes start to change. I remember thinking Mars bars were disgusting as a kid, and now I can't help but shove those mini ones in my mouth every 5 minutes. Though, to be quite honest, my lack of A/C all summer is probably to blame for my new love for the Fall season. Regardless, I am obviously obsessing over 2013 Fall/Winter Style!! I've been spending my days dreaming up go-to looks in my head, which get me giddy with excitement. Does anyone else find excitement in their own imaginations of styling looks? *crickets*. My own take on grunge isn't as literal as most people like to take the trend. As with most trends, I take my favourite aspects and make them my own. If you are a bit uneasy about going full Kurt or Courtney this Fall, here are 10 ways you can incorporate the look without having friends or family approach you about your innermost feelings. Here are 10 ways to rock grunge...subtly. Colour plays a huge part when it comes to style; the same piece in different colours can portray an entirely different look. When going grunge, stick to deep dark neutral shades such as black, grey, navy, darker reds, and darker greens. The cutest way to stay warm! Pick up a couple basic knit toques (beanies) in a dark solid colour. Stay away from prints, but witty words are always fun. In my honest opinion, wearing scarves doesn't really come to mind when I think about grunge style, but it's so cold today that I thought -- why not?! Again, I would steer clear of wacky prints and go for something solid and neutral. This will be an essential piece to your Fall/Winter grunge look. You'll be wearing it the most and it will be the most visible. Again, stick to the dark colours, but you can mix it up a bit with fabric that is textured, has a multi-coloured knit, or with a colour-blocked pattern. I think this is a given for fall/winter style in general. Warm knit sweaters! Oversized or cropped. Fun prints in neutral colours are a yes. When it comes to pants, a skinny fit is a must -- especially to accommodate whats up next: combat boots. Where other pieces can be styled to look grungy, combat style boots ARE grungy. They are an absolute staple when trying to pull this look together. If you can't afford Dr. Martens, you can always find a cheaper alternative here, here or here. 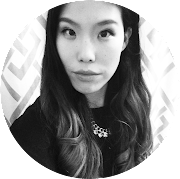 Hair down, in a low pony, or braided; tastefully messy hair is in. I say tastefully because I don't want you throwing your hair about to create a hot mess. Texture sprays and dry shampoo will be your best friend. Stay away from the traditional black, and try a subtle bronze or brown-toned smokey eye. It gives you the grunge look without being over-the-top. It's that time of the year again. Try a dark lip -- but do it matte! Fortunately, many cosmetic lines have recently released new matte formulas that actually breathe and moisturize rather than drying out your lips. Go for dark plum wine hues. Delicious. FYI, I have been loving this line by Revlon! Hope this was helpful for some! I've already started to incorporate the beauty looks, and I've recently ordered a cute oversized jacket and combat boots from Tobi.com! Look forward to a Fall Beauty post to come! Who else will be rocking the grunge look this fall?? Totally agree with all of this, hah! Maybe it's just these past few years, but it seems like chic grunge/casual streetstyle is an essential fall look. like all of the layers and textures and shapes just go so well with Fall. i love matte lips for autumn! Me too!! It's always such a hit or miss with different brands though! Which brands have you been loving?? This is my style. I love this time of year cos I get to layer, I get to wear all my black & greys with ease! Great post ! 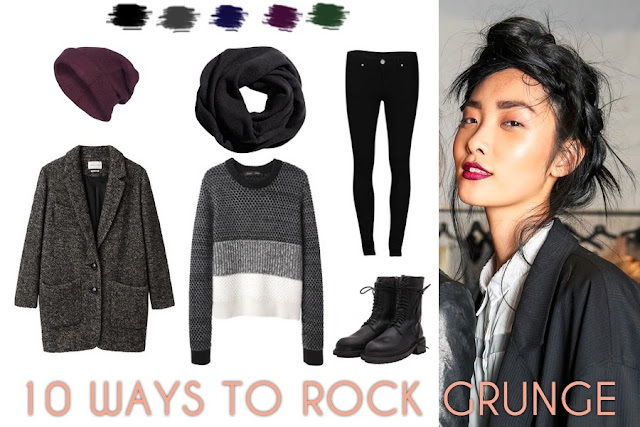 I will definitely be rocking grunge, absolutely love it with a hint of chic!